Your opportunities include our state-of-the-art labs, multidisciplinary projects and working directly with medical professionals on new devices. 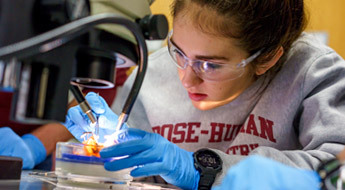 At Rose-Hulman, you’ll start to hone your lab skills very early on, with hands-on research using state-of-the-art lab equipment. You’ll also gain new insights, share your work, attend conferences, and gain valuable research experience. 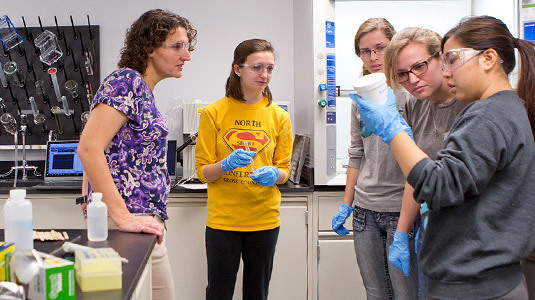 Every biology major completes a four-quarter independent research project with the guidance of a faculty mentor. You’ll be responsible for proposing the scope of your research, designing and conducting experiments, collecting and analyzing data, and drawing defensible conclusions. You’ll then present your work to the community in a formal oral presentation and a written thesis. 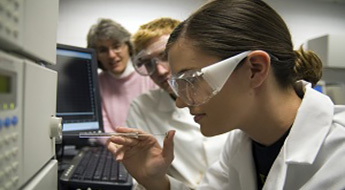 This is just one opportunity for you to practice your scientific inquiry and management skills, while gaining experience communicating your findings to a larger audience. 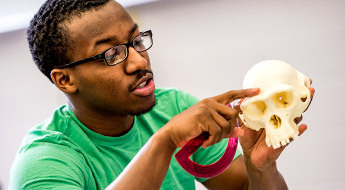 As a Biology or Biomedical Engineering student, you’ll have many opportunities to collaborate with students and faculty in other fields through research and through involvement in campus organizations. 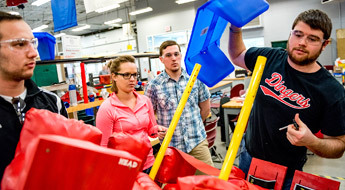 One such organization is Engineers Without Borders, a multidisciplinary group where students can apply their knowledge and skills to real-world problems, often helping some of the planet’s neediest people. Another opportunity is the International Genetically Engineered Machine (iGEM) competition, which brings the best multidisciplinary teams from around the world to compete to produce biological parts, educational materials, and functional biological machines. 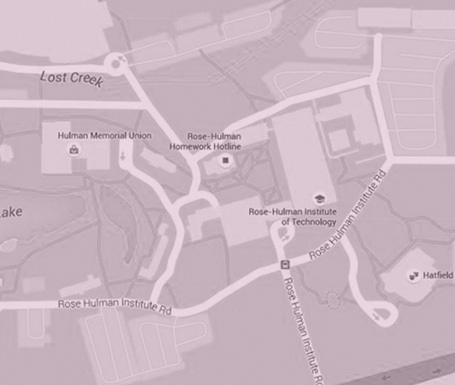 Many Rose-Hulman grads have gone on to have rewarding schools as physicians. With constant advances in technology, medical schools are very interested in students with engineering and science backgrounds. Talk with your advisor to find what courses you'll need to prepare yourself for the Medical College Admissions Test (MCAT). If medical school is in your future, we can help you get there. 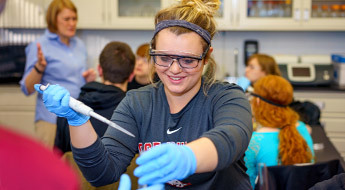 We offer our biology and biomedical engineering students a variety of state-of-the-art labs, including facility for studying joint-replacement medical devices, a modern greenhouse, motion analysis lab, and tissue culture lab. Economic and social theorist, writer, public speaker, political advisor, and activist. Dr. Dee earned her M. Eng. 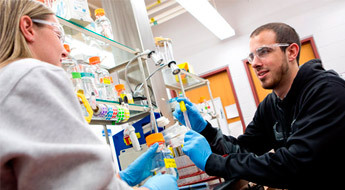 and Ph.D. degrees in biomedical engineering from Rensselaer Polytechnic Institute. 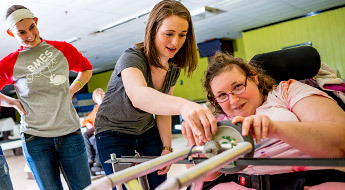 She then taught at Tulane University before joining the faculty at Rose-Hulman in 2004. 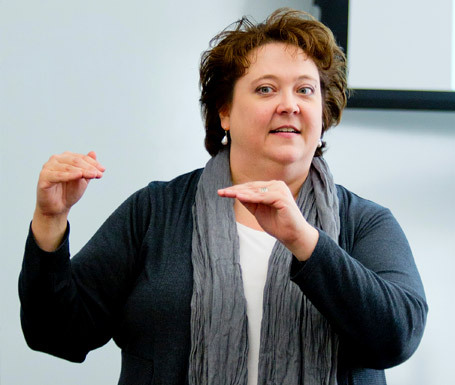 She has received several honors and awards for her teaching and research, including Professor of the Year from Carnegie Foundation for the Advancement of Teaching, and a CAREER award from the National Science Foundation. Her research interests include student learning styles, helping faculty to be most effective in the classroom and assessments of teaching and learning. She also authored the textbook An Introduction to Tissue-Biomaterial Interactions.